The same owl made news in 2016 when its chicks drowned after hatching during heavy rains. A female owl and her owlet, who are living in an owl box on Gleneagles Road in Greenside, were ringed on 6 August so they can be easily identified in future, Rosebank Killarney Gazette reports. The owls were ringed by Jonathan Haw, the director of Ecosolutions, who has been running the Owl Box Programme for more than 20 years. 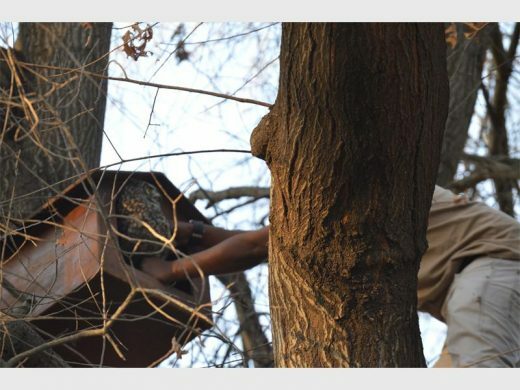 EcoSolutions currently has about 80 owl boxes around Johannesburg, which provide a safe haven for owls. The owl box on Gleneagles is a particularly dangerous spot for an owl to nest, as the road is very busy, and any owlets who hatch there run the risk of being run over when they move to the ground to fledge. The same owl was in the news last year when two of her chicks drowned in the tree in which their eggs had hatched after heavy rains. 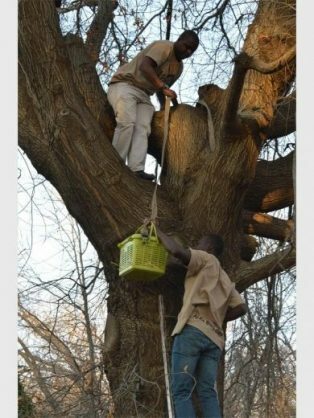 After the two chicks drowned, EcoSolutions were called to build an owl box in the tree, as the owl normally returns to the same tree year after year to lay her eggs. Greenside residents eagerly gathered on the road to get a chance to see their resident owl and her owlet. Parkview police closed off Gleneagles Road so that EcoSolutions could ring the birds without worrying about cars speeding by. “The reason we’re ringing them at this time of the afternoon is that we’re going to disturb the female, so she’s going to come out of the box and go and land in one of these trees. As soon as we’re done she can be back in her comfort zone,” said Haw. Haw added the reason for ringing the owls is because they often come across owls who were born in different areas, and it helps to keep track of where each owl comes from. The owls were fitted with Safrings, which are provided and recorded by the Avian Demography unit attached to the University of Cape Town. The owls now have individual numbers that identify them.